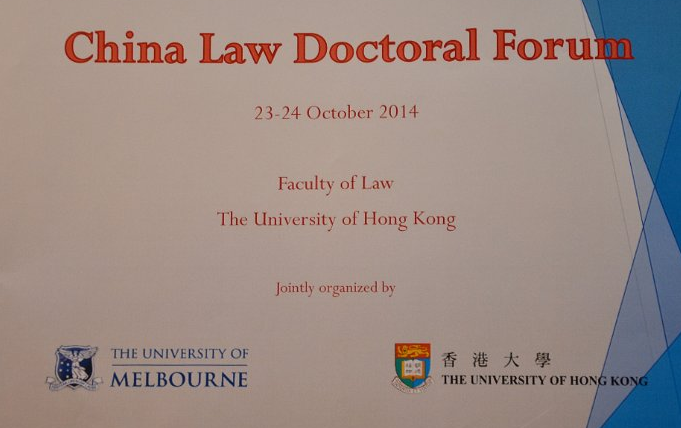 This blog reported on the first China Law Doctoral Forum held at the University of Hong Kong from 23-24 October 2014. The working papers from this event have recently been revised. We are pleased to publish them here on the HKU Legal Scholarship Blog. The papers can be downloaded by clicking on the titles below. The photos from the event can be found here. "Reflections on the Amendment of Chinese Administrative Litigation Law (2nd Revision) from the perspective of UK Judicial Review and Tribunals"
Abstract: The thesis studies the amendment for the first time of the Administrative Litigation Law of China since its enforcement in 1989. It falls into four parts. The first part outlines the historical evolution of the Law from 1949, its initial enforcement and the status quo, before exploring the multiple factors prompting its amendment. The second part deals in depth the three rounds of revision and makes an all-round comparison of the original, the draft amendments and the 1st and 2nd version , encompassing the crucial topics, the functions, the scope of legal review, the standing, the structure of court system and judgment. The third part gives an account of progress made at different stages and the crucial factors at play, which are sorted by function. In conclusion, the author points out that despite the progress achieved, there are still outstanding issues. Since the function of Law is the decisive factor and prerequisite of this amendment, all of the rest elements should be addressed correspondingly, but the revision has shown much reluctance in this respect, leading to a structural inconsistency, which might be open to challenge in the future. "The Liability Immunity Scheme in the Administrative Accountability System of China"
Abstract: The administrative accountability system should not only function as punishment, but also guidance for government officials. The systematism of accountability procedure is surely the foundation, but it is also worth considering that how to promote the predictability of the result. China should construct the liability immunity system with good faith standard to offer government officials both legality and reasonableness standard. A liability immunity clause could function as guidance and protection in two circumstances, namely the circumstance of administrative decision making and when the rules are ambiguous. "The transition of paradigm from the 'encumbrance' to the 'real right for security' - interpretation from the view of establishment of the seaman’s lien for wages"
Abstract: In the theory of “encumbrance” of common law, the establishment of seaman’s lien for wages mainly derives from the fact of “service to the ship”, while its legal basis is the claim for wages secured by the lien in the norms of the civil law. Accordingly, it is well-advised that Article 30 of Property Law of People’s Republic of China is applied to the establishment of seaman’s lien for wages, on the basis of the nature of seaman’s work which is factual act. In the view of comparative study, the transition of legal paradigm which is from the “encumbrance” to the “real right for security” should be accomplished in our current rules. "Narrative Study on Witnesses’ Involvement in Their Statements"
Abstract: The present study, based on Labov’s narrative theory, focuses on how witnesses’ involvement affects their narrative reconstruction of the criminal case. Witnesses’ involvement is first subcategorized and there are two circumstances concerning their involvements, one being single suspect versus victim(s) crime and the other multi-suspects versus victim(s) crime. The present study takes four witness statements from a single suspect malicious injury case as data to further analyze the effects exerted by different witness involvements on witness statements and their corresponding representations. Results of the analysis indicate that how witnesses are involved in the criminal event exert different effects on witness statements in three aspects: narrative structure, participant distribution, and language strategies. The results of this study further reveal that the more legal responsibility a witness is likely to take for the criminal event, the more transformations he would make in his narrative reconstruction of the crime. "The Independence and Supervision of the Judicial Power-in the view of Injustices"
Abstract: In recent years, there have risen many injustices in China. As I see, that’s because of the failure of the judicial system. The alienation of the leadership of the CCP, the deficiency of the independence and supervision inside judicial system, and the distortion of the relationship between judicature and people all lead to the neither existence of independence and supervision of the judicial power, which forms a pattern of injustices. Therefore, China needs on one hand change its theory of the operation of the judicial power, which should be taking the independence as the basic, taking the supervision as the check in order to cultivate the coexistence of the independence and supervision of the judicial power. On the other, China needs to reconstruct its judicial institution, which includes coexistence of the independence of the judicial branch and the supervision of the legislature branch, coexistence of the independence of the judging and prosecuting and the supervision inside the judicial system, coexistence of the independence of the judges and prosecutors and the supervision of the public voice, and the coexistence of the independence of the judicial procedure and the supervision of the CCP. With those developments could China totally cleans the soil cultivated injustices and promotes the smooth operation of the criminal judicature and realizes social justice.